This Dapper Dude Is The Best-Dressed Pensioner In The U.K.
We live, breathe, and celebrate personal style in all its glorious forms. And, fashion isn’t just for the young and the restless. Pensioners can strike perfectly arched poses, too, as Ari Seth Cohen’s inspirational blog, Advanced Style, proves oh so well. British GQ jumps in on the act with its latest list of the "Best Dressed Men of 2014." 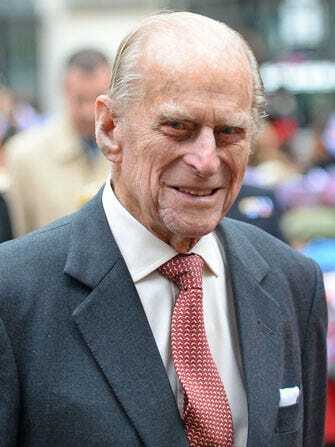 The monthly style bible lists the Prince Philip, Duke of Edinburgh as the 26th most stylish man in all of the U.K. And, we couldn’t agree more. It seems the 92-year old’s love of a double-breasted suit caught the attention of the magazine’s editorial team. Bill Prince, deputy editor, explains to The Guardian the influence the Prince Consort casts over the sartorial decisions made by the rest of the royal family. “Top-down management still rules among the royals, evidenced by the degree to which the Duke of Edinburgh's sons, grandsons (and who knows, great-grandson) hero-worship his time-honoured style." Nick Grimshaw, the new ambassador for menswear for the British Fashion Council, tops the list at number one, closely followed by last year’s swoonsome winner Tom Hiddleston, and Sherlock star Benedict Cumberbatch. Click through to see the entire list and don’t forget to snap up a copy of the February issue of GQ when it hits newsstands on January 2. Let us know in the comments section below if you think there are any notably dapper omissions.